Looking for a great activity to do with your kids this Holiday season? Make a gingerbread house, or two, or three..... or a village! It is a fun playdate that you can do with your kids and their friends that will keep them all engaged and entertained. We made our houses with graham crackers. It's economical and easy to handle when building the houses. Perfect size for toddlers. There are a variety of recipes for Royal Icing. I ran out of Cream of Tartar but found a great recipe that I was able to do without this ingredient. If having a Gingerbread Decorating Playdate, ask each parent to bring a topping to be shared. As the host I provided and premade the gingerbread houses the night before to ensure the icing dried and the houses were strong enough for decorating. I placed each house on a disposable Christmas plate so it was easy for each child to bring home. We set up around the table and placed all the ingredients in the middle to share. Everything from smarties, to candy corns, candy canes, marshmallows, coconut, little itty-bitty gingerbread men, and so much more. 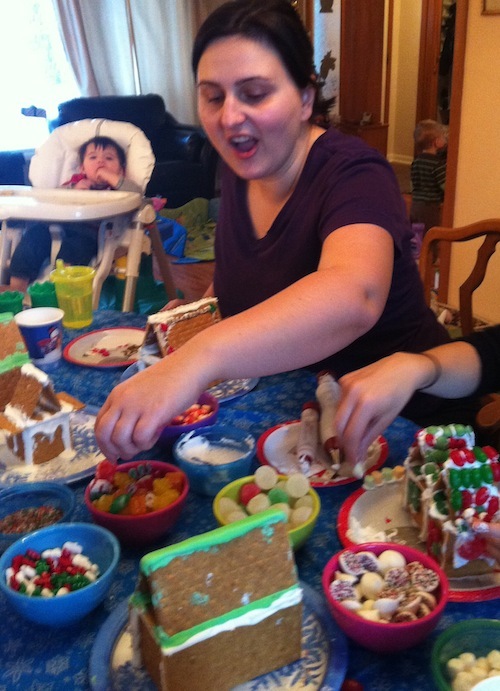 The Bulk Barn has a great selection of treats to decorate gingerbread houses. Can you believe we were all gingerbread house virgins! It was all of our first times decorating a house. Needless to say the moms might have had a bit more fun then the kids! Wisk together the egg whites and 1 1/3 cups of the powdered sugar until smooth. Add the remaining 1 1/3 cups of powdered sugar to the mixture. Beat on high speed until the icing holds stiff peaks. Add more powdered sugar if needed, until stiff peaks form. Place a dampened clean towel over the bowl of royal icing to prevent it from drying out while you work with it. Once you are ready to use it, fill a pastry bag (or ziploc bag with the tip cut off). We had lots of fun and can't wait to do this again next year. 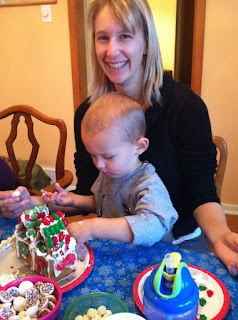 I might even attempt to make my own gingerbread houses from scratch! Okay, who am I kidding.... I so won't! Happy Holiday!